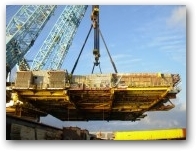 The decommissioning of the Total’s TCP2 module support frame (MSF) was a significant component of the contract awarded to Peterson SBS and Veolia Environmental Services by Aker Solutions for the Frigg Cessation Project. 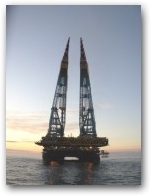 Weighing approximately 8,730 tonnes, the MSF was one of the largest single decommissioning lifts yet in the North Sea. 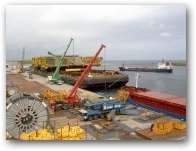 The S600 transport barge was the largest yet to berth at Lerwick’s Greenhead base – when trailered onshore the total weight crossing the quay including grillage and trailers was around 11,100 Te. 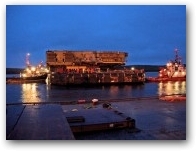 Peterson SBS project managed the load-in at Lerwick, which required significant engineering and preparatory work. 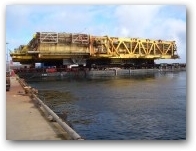 Peterson SBS co-ordinated and managed the engineering, planning, construction, fabrication and preparatory works that were required to make the site and barge ready for the trailer load-in of the MSF from the S600 (skid railed) launch barge ready for a trailer load-in. 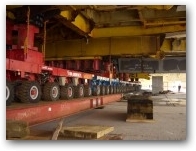 Planned for a specific date and tide, the load-in required 358 axle lines, mobilised from Europe, America and Asia. Tailored ballasting and mooring systems also had to be mobilised and installed. 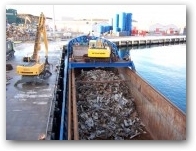 Peterson SBS supplied cranage, haulage, cargo handling and labour. A large number of contractors and sub contractors were involved, with specialist plant and labour provided by local companies and steelworks by on-site fabricators. 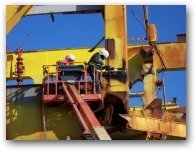 The schedule was planned and managed by Peterson SBS and completed on schedule, without significant incident or lost time injury (LTI). 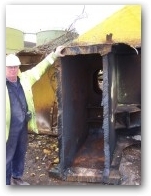 Decontamination, with systems, pipelines and vessels opened, inspected, sampled and tested. All fluids were drained and asbestos was removed in accordance with regulations, as was waste electrical and electronic equipment. Veolia planned and managed its own skilled operators and specialist subcontractors for the decontamination process which took around three months to complete and was followed by inspection ahead of the final phase. 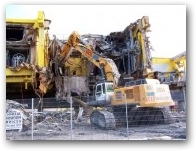 Deconstruction was also overseen by Veolia which was responsible for planning and engineering of the method, using a specialist subcontractor for the works. 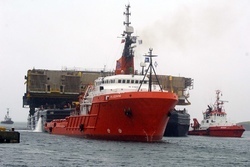 All onshore operations on the TCP2 MSF were completed on schedule and without significant incident or lost time incident, proving Shetland’s capability to safely and efficiently handle large scale decommissioning projects.